Any student that has preregistered for our group Open Water Scuba Diver course should arrive at New England Dive with their E-learning materials completed for the first day of Confined Water 1 (CW1) Training. This is day 1 of 3, the class is held at our facility in a dry classroom setting. During this time we will issue the life-support equipment needed for day CW2 & CW3 (that are conducted in a pool setting), fill out paperwork, and lecture about the information learned using the E-learning program. CW day 2 & CW day 3 are held in one of the local pools we use for training. Times and locations vary please confirm with your customer service dive professional when signing up for your class. *Please arrive at least 30min early to class if you have not already purchased your Personal Gear Package. 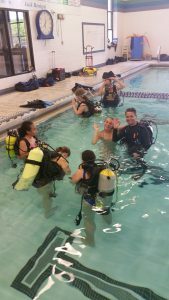 We make sure to have dive professionals available during all business hours for custom fittings if a student would like to purchase their package in advance to the course. $550.- INCLUDES ALL MATERIALS, PERSONAL GEAR, CW TRAINING, & OW TRAINING. $300.- ADJUSTED FOR STUDENTS WHO CHOOSE TO COMPLETE OPEN WATER (OW) DIVES ELSEWHERE USING THE GLOBAL REFERRAL PROGRAM. Persons desiring to obtain a Scuba Diving certification and those interested in underwater exploration. This course is designed to give you the necessary skills to safely conduct open water dives. This course is the key to start exploring dive destinations around the globe or even in your backyard. You may go swimming in the ocean or snorkel over a reef, but now it’s time to take it one step further. See the underwater world as it is meant to be experienced – underwater. Minimum age 18, 15 with parental consent (age 10-14 = Junior Open Water certification). Conduct open water dives in conditions similar to their training. Continue their dive education by enrolling in SDI Advanced Adventure Diver and other Specialty courses. *NOTE: JUNIOR OPEN WATER SCUBA DIVERS (AGES 10-14) MUST PARTICIPATE IN ACTIVITIES WITH A PARENT, GUARDIAN, OR DIVE PROFESSIONAL. Dive equipment selection, assembly, use and maintenance. Basic scuba skills including mask and regulator skills, swimming underwater, buoyancy control, basic rescue techniques, and emergency procedures. Demonstrate mature and sound judgment concerning dive planning and execution. Satisfactorily complete the SDI Open Water Scuba Diver knowledge quests or equivalent online learning course. Complete all open water requirements safely and efficiently. Get E-Learning code directly from New England Dive. Come in for a Custom fit Personal Gear package: Mask, Fins, Snorkel, Boots, Defog, Mesh bag. 1 Classroom (Thurs 4 HRS), 2 pool sessions (Sat 4 HRS) (Sun 4 HRS). Complete the Open Water training portion of course ($250.00 Fee) Includes: Instruction, Gear, and Printed C-Card.